There's a new movie coming out called, "Run, Fat Boy, Run". It's about a man who tries to win back the love of his life by running the marathon. I wonder if there's a blog by that name out there somewhere. Anyway, this boy had his two best runs since the marathon last night and tonight. Last night I got in 5.17 miles at a 12:10 pace. My last full split was at 11:44 and the .16 of a mile to end the run was done at a pace of 8:26. I can really turn it on when I see my driveway. One of the big differences in this run was music. I listened to music for the first time in months and it seemed to help. Tonight I was hoping I could rock on to an even better time. I listen to a wide selection of music. The Beatles, Arlo Guthrie, Robin Lacy, Billy Joel, Train, U2, Vince Gill and some singers I won't admit listening to. I bet no one out there has heard of Robin Lacy. I went to school with Mike Hermann, who is in the band. Anyway, tonight I dropped my pace down to 11:27 for 6.64 miles. Only four short walk breaks. It was how I remember running used to be. My last .64 miles was done at a pace of 10:51, just 19 seconds slower than the first mile pace. Congratulations, we are almost to the half way point and everyone is doing great. Amy's team has 880 miles todate. Katie B is leading the way with 160.8 miles and Robbie and Taryn are close behind. Pat's team has 940.2 miles and Jeff out in Baltimore is leading with 237.4 miles. Katie R. is close behind with 205.8 miles. You'll notice not everyone has mileage up to week 7, if I missed some of your mileage please let me know. As teams, both groups have made it from the Mexican border to Utah and back already. Some of you that are in the two hundreds, better bundle up. There's snow in northern Arizona. I hope everyone has a wonderful weekend and a Happy Easter! Hope you are having a wonderful St. Patrick's Day. Here's a little bit from Celtic Thunder. Mile 1339, chandler, AZ - 6 miles in about 1 hour 15 minutes. 62 degrees, slight breeze and an occasional drizzle. Here's my ideal of a perfect Friday night. First get to Kiwanis Park around 6:30 pm. Run 3 miles around the large lake, past the softball fields and batting cages and around the tennis courts. Get back to your car and swap out your garmin and Asics for your softball cleats and bat. Head on over to the batting cages for a quick 20 minute tune up. Get to the softball fields a bit before your 8:30 game. The game starts, two first place teams playing for outright lead in the league. The other team, Lincoln Shenanigans playing St. Matthews UMC. Shenanigans takes the lead 5-4 and then 8-5. St. Matts gets a big 6 run 5th inning and takes the lead 11-8 with one inning left. I'm pitching, we give up one run and then stop them dead. St. Matts wins and gets sole possession of first place with one week left in the season. Afterwards, Team St. Matts heads over to Chuy's for some suds and sliders. Mile 1330, Chandler, AZ - Many of you read Runner's World. You may have read about the small running club, 2 members, that run in NYC. They named their club 7 at 7, because they run at 7 am for 7 miles, sometimes. It may have reminded you of our little club here in Arizona - the Tumbleweed Running Club. When I started running, I never would have thought that I would enjoy running with others. When I joined 'Team in Training' I never really got into running with anyone specific. At that time I thought I would run alone forever. Then, someone read my blog. Which is amazing in itself. Her name was Karen and she was looking for running buddies here in chandler, AZ. I suggested she contact Lisa. Lisa was a local runner I had met thru my blog and at the New Times 5k, way back when. If my memory serves me right, they started running together and then invited me. We met one Saturday morning to run the canal at Tumbleweed Park. 2.5 miles to the gas station and back. It wasn't fast, but it was fun. Finally, I found runners that I enjoyed running with. Now, we run off and on and we run 5-12 miles at a time. Of late, I've been nursing one injury after another and haven't run with the girls as much. I miss it and I often feel bad that I don't get to run with them. Sorry, gals. Well, last night in honor of our running brethren in NYC, I did a 7 at 7. Just around 7 pm I ran 7 miles and then ran 1.11 miles more. I got to run thru Andersen Springs, a nice community with a sidewalk down the middle past the lake to Arrowhead Park. Arrowhead is the park Lisa did her first triathlon at. I then headed east on Ray, north on Alma School and west on Warner. Did a few laps around the middle school track and ran a bit on the baseball field. There's something about being on a baseball diamond, even if it's empty. A little league team was practicing on the adjoining field and I got to hear the thwack of the bat. That makes 7 miles on Monday and 8.11 miles on Wednesday. My abdomen still hurts, which slows me down. But, each day it gets better. No Half Marathon, but at least I got 7 in. Yesterday I was supposed to run in the Valley of the Sun half marathon in Mesa with buddies, Karen and Lisa. With all my little aches and pains, I didn't want to DNF, so I DNS'd (Did not start). But, today I ran on a new part of the canal in east Mesa. I had to get a town home ready for it's new owner over in east Mesa, so I figured I could get in a run afterwards. I started around Southern and Higley roads, if you know Mesa and headed south for 3.5 miles. The picture is from a western themed restaurant that has a ghost town. There's a cross on the top of the hill, some kind of pens at the bottom and old wooden pictures just out of the photo. I forget the name of the place. Does anyone know it? The canal runs along two different golf courses, I got to see some golf along the way. I just remembered the name - The Rockin R Ranch. I pulled a muscle in my abdomen and it's been hurting, so my times have been slow. I was just glad I got in 7 miles in around 1 1/2 hours. The stats and map are below. A sign I saw on my run yesterday. Why did they bury them? We march northward toward Phoenix. Many of us are over 100 miles, others are closely behind. I'm having some leg issues and time issues, so my mileage isn't what I want it to be. I hope you all are doing well. Eric leads my team with 160 miles followed closely by Jeff. Both these men have wonderful blogs about their running. Click on their names to read more about Eric and Jeff. Eric just finished the Rangar Del Sol Team race and his last entry is about that race. Jeff just finished his first half marathon. Read about it on his blog. Robbie leads Amy's team with 123 miles. Robbie lives in St. Louis, so many of her miles are probably in the cold. Pretty impressive to get that mileage in up north. Robbie and Amy used to work together at Famous Barr, a May Department store that is no longer. Miles 1310, Chandler, AZ - I got in a 6 miler last night and a 3.1 miler the day before. Two days ago, I ran on part of the canal I had never run on before. South past the new Mesa Riverview shopping center, up to the Mesa Country Club, where I had to turn around. Then on the north end of the shopping center past Bass Pro Shops. If you haven't been in a Bass Pro Shop, it's worth it. Even if you are not a fishermen or hunter. Then yesterday I ran around my neighborhood to the lake and back. It was slow and my lower abdomen hurt. It's my newest hurt, but I think it's getting better. The good news is I just passed 13oo miles for my career. Tonight I'll add some more as I go to run and work out at the Tumbleweed Recreation Center. I'm still running. I'm still playing softball. I'm still selling real estate. Matter of fact, the real estate has really picked up. I'm listing properties every week and working with multiple buyers. This is a good thing and I'm hoping 2008 will be great. Last year was good, despite the slow down. Prices are still falling, but the townhome market seems to be brisk. And that is why I haven't been blogging as much as before. I hope to catch up on many of your blogs, as time allows. Running? I've been getting in 3-5 mile runs 3-4 times a week. My knee isn't hurting, but it still is larger than it's cousin on the right side. I've not had much time to get in long runs and I doubt I am ready for the half marathon next weekend. I've missed the last two 5k's I wanted to run in. No sense in paying for a race when I don't feel like I can run it well. Softball? The men's league I play in on Thursday night finished with a great tournment. We squeaked into second place on the last week of the 7 week season and finished with a 10 win, 4 loss season. Highlighted by shutting out the first place team 21-0. It was my first ever softball shut out as a pitcher. We played the tournament last Thursday. Won the first two games and had a 10-0 lead after the 1st ininng against the team we shut out earlier in the year. However, they came back to beat us 15-11. I played 2nd base all three games and had a great time. I like to pitch, but it's fun to get to play other infield positions. The coed team I play on is 4-0. It's a 7 game season with a tournament and we should go undefeated. Which means another tee shirt. 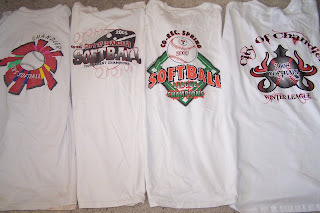 The picture above is some of my softball tees. You get them for finishing in the top two in the league. Tonight I have a 5 mile run planned right before I sub in for another softball team. Hope all are doing well and good luck to those that are running races this weekend.